The Trailways Transportation System (Trailways) is celebrating more than 80 years of operational heritage this year. 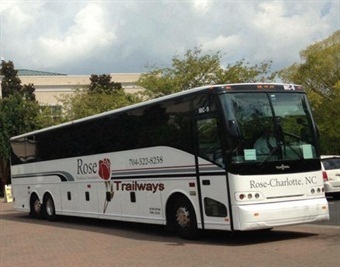 The team is also welcoming Charlotte, N.C.-based Rose Chauffeured Transportation (Rose Trailways), as its newest team member. "We are most pleased to add this Carolina star to our team," said Ron Moore, Trailways chairman and president of Burlington Trailways of Iowa. "The company's 30-plus years of award-winning operating experience in the transportation industry and impressive fleet of vehicles will enhance our ability to serve customers from an important region on the east coast." Rose was founded in 1985 by the Thompson Family as a limousine company, started with only three employees, specializing in transportation for weddings. Since then, Rose Trailways has grown to over 100 employees and a fleet of 50 vehicles that includes full-size motorcoaches, minibuses, vans, SUVs and sedans. The company's major service markets now include corporations, schools and professional sports teams. GM Tom Holden said Rose's Team Trailways affiliation joins two important brands in the motorcoach industry. Rose has been a leading ground transportation provider in the Carolinas and ranks regularly among the South's top 100 small businesses. "We believe Team Trailways can assist us in expanding business outside our region," Holden continued, "and we think we have expertise we'd like to contribute to the team."